Why would you part with good money for a sports version of a perfectly sensible and stylish car? To us it has always seemed like forgoing a good pair of jeans for some more expensive cut-off jean shorts. They may look good on the hanger, but only the few who could pull them off (so to speak) would fork out more cash for them than slim-fit Levi's. We have certainly never thought we had the requisite pep, nor legs, for either the car or garment. However, ever persuadable, we tried the Audi S5 coupe out this week and it gave us a bit to think about. Not so you'd really notice. Yes, obviously with it being a coupe, room at the back is affected, but we had four large adults in there with absolutely no issues. There are only two doors, but getting in and out is easy enough, no matter what your size, and with that smaller back end it gives the driver a bit more fizz in the corners. But we're getting ahead of ourselves. Talking about the interior, we really loved it. That high-end feel of leather and chrome, the pilot-style gadgets and tech are always impressive. Even if you don't possess the lyrical dexterity of a poet, nor the eye of a classical artist, you will still try and sing from the rooftops about how gorgeous this car is every time you go to start it up. We mean, come on. Look at it. Now imagine a normal A5. There's no comparison, right? An A5 is by no means ugly, but it's a bit, well, sensible. This S5 has the internal sensibility of a typical Audi, but it's wrapped up in a stunning, angular frame upon which we would never tire of gazing. Look at those air-intakes! In a word, yes. Considerably. A standard A5 2.0 TFSI will do 0-100km/h in 7.2 seconds. 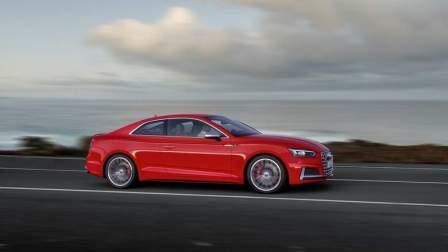 This S5 does it in 4.7 seconds. For you, this may not seem so important, but out there on Sheikh Zayed Road it really makes all the difference. A V6 over a four-cylinder in-line engine also creates a far more pleasing noise. Again an A5 is pleasant, by why settle for the engine sound equivalent of Bachman-Turner Overdrive when you can have The Who? Put your foot down in this and everyone will instantly know about it. Will people call me Flash? Perhaps on first glance. There's no denying this car is glamorous. However, there is also an understated elegance to it we rather like. Plus you're forgetting, you're driving an Audi, the very definition of the type of car someone with their head screwed on right chooses. So you look a little more flamboyant; we're in Dubai, that's sort of the point. Plus you'll be the one enjoying a precision, stable drive in almost any condition and will begin to enjoy showing off those S-specific exterior details and designs. Okay, So what's the catch? As far as we can see, there's only one and it depends how you look at it. The S5 costs about Dhs90,000 more than the starting price for an A5. But then, you are getting a much better car. They are incomparable in anything but a shared DNA. Like actors John Belushi, when he was still around, and his brother Jim. There's a reason John commanded millions of bucks in classic films and Jim is on a sitcom we would rather set fire to the TV than watch. John is just better.